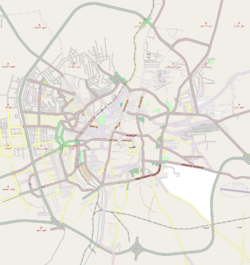 Sheikh Maqsood (Arabic: الشيخ مقصود‎, Kurdish: Şêxmeqsûd, شێخ مەقسوود‎), sometimes spelled al-Sheikh Maqsoud, Maqsud or Maksud, is a neighborhood in the city of Aleppo, Syria. It is populated mainly by Kurds and is under the control of the Kurdish People's Protection Units (YPG). In February 2018, some YPG fighters left the district to move to Afrin, which was being attacked at the time by the Turkish Armed Forces and allied rebel groups as part of Operation Olive Branch. During the Syrian Civil War, Kurdish YPG militias took control of the neighborhood. 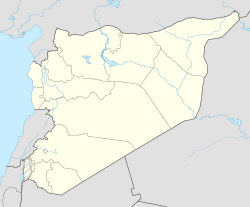 Far away from the Kurdish inhabited enclaves, Sheikh Maqsood had been very vulnerable to assaults by the Al-Nusra Front and other Islamist rebel groups which were besieging the district from all directions but the south and west until they were driven back by pro-government forces during June and November 2016. Islamist rebel groups shelled Sheikh Maqsood many times, causing destruction of property and injury and death of civilians. In May 2016, Amnesty International's regional director suggested that the attacks on Sheikh Maqsood constitute "war crimes". Between February and April 2016 more than 83 civilians were killed by the attacks. In mid-June 2016 Russia accused the rebel militias of causing the death of over 40 civilians in the month. A Syrian Democratic Forces spokesman accused rebels of causing 1,000 civilian deaths and injuries, through shelling of Sheikh Maqsood. ^ a b "Syria: armed opposition group committing war crimes in Aleppo - new evidence". Amnesty International. 13 May 2016. ^ "Syria: nearly half rebel fighters are jihadists or hardline Islamists, says IHS Jane's report". The Telegraph. 15 September 2013. Retrieved 11 June 2016. ^ "Guide to the Syrian rebels". BBC. 13 December 2013. Retrieved 11 June 2016. ^ "Syrian Islamist rebels renew chemical attack on Kurdish district in Aleppo". Ara News. 14 March 2016. Archived from the original on 16 May 2016. Retrieved 11 June 2016. ^ "Syrian rebels massacre Kurdish civilians in Aleppo". Ara News. 6 April 2016. Archived from the original on 9 June 2016. Retrieved 11 June 2016. ^ "Rebels strike Kurdish neighborhood in Aleppo with chemical gas". Al-Masdar News. 7 April 2016. Retrieved 11 June 2016. ^ "Aleppo district shelled with chemical gas – local journalist". RT. 7 April 2016. Retrieved 11 June 2016. ^ "About 65 casualties and injuries in shelling and launching explosive cylinders on Sheikh Maqsood neighborhood". SOHR. 16 April 2016. Retrieved 11 June 2016. ^ "Russia shows support to Kurdish-led SDF north Syria". ARA News. 14 June 2016. Archived from the original on 14 June 2016. Retrieved 14 June 2016. ^ "Report of the Independent International Commission of Inquiry on the Syrian Arab Republic" (PDF). United Nations. 2 February 2017. Retrieved 1 March 2017. ^ "UN says Syrian rebel shelling of Kurds 'a war crime'". ARA News. 2 March 2017. Retrieved 2 March 2017.